The following is an excerpt of the transcript from Paul Dohse’s 3rd session at the 2015 TANC Conference on Gospel Discernment and Spiritual Tyranny. Biblicism does not reject mystery, or paradox, but always approaches the latter with extreme skepticism. Biblicists consider paradox guilty until proven innocent. God is not a God of confusion, but be sure of this: the paradox card is more times than not a license for a mystery that only the spiritual elite understand—those who have the rule over you. If the promise and the gift are verbally offered to all people, but the offer is not legitimate for all, that makes the use of these words completely illogical. Though the issue of election will not be explored in this series, the basic wrongness of Protestants who propagate so-called “sovereign grace” must call their deterministic gospel into question. 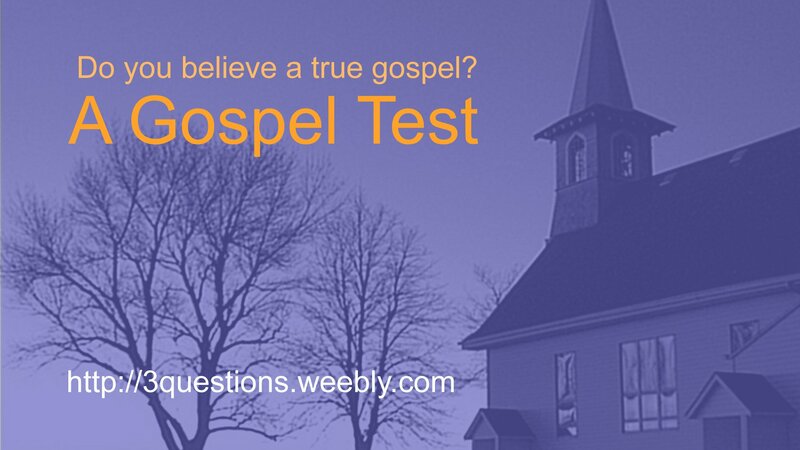 Those who have the basic gospel completely wrong cannot be trusted with the rest of the story. However, the fact that salvation is a promise and a gift will be key to exposing the false gospel of Protestantism in simple terms. The Bible defines the gospel with these specific words for good reason – words mean things. 1Corinthians 15:3 – For I delivered to you as of first importance what I also received: that Christ died for our sins in accordance with the Scriptures, 4 that he was buried, that he was raised on the third day in accordance with the Scriptures, 5 and that he appeared to Cephas, then to the twelve. 6 Then he appeared to more than five hundred brothers at one time, most of whom are still alive, though some have fallen asleep. These are the facts of the gospel, but in Paul’s statement much more is assumed rightly because of other texts that further define what is being stated here in 1Cor 15:3-6. Obviously, no one is saved by a mere believing of the facts concerning the gospel. As James wrote, the devils believe also and do tremble in regard to their future condemnation. The facts do need to be believed, but what saves is the following of Christ in these facts. In other words, it’s not a mere believing of the facts, but also the belief of what the results of believing are, and a desire to want that for yourself. You believe the promise, and the gift, and you want the gift for yourself. The gift is the baptism of the Spirit, and believing in the transaction that takes place. It’s believing the promise and “receiving” the gift. Romans 6:1 – What shall we say then? Are we to continue in sin that grace may abound? 2 By no means! How can we who died to sin still live in it? 3 Do you not know that all of us who have been baptized into Christ Jesus were baptized into his death? 4 We were buried therefore with him by baptism into death, in order that, just as Christ was raised from the dead by the glory of the Father, we too might walk in newness of life. 5 For if we have been united with him in a death like his, we shall certainly be united with him in a resurrection like his. 6 We know that our old self[a] was crucified with him in order that the body of sin might be brought to nothing, so that we would no longer be enslaved to sin. 7 For one who has died has been set free from sin. 8 Now if we have died with Christ, we believe that we will also live with him. 9 We know that Christ, being raised from the dead, will never die again; death no longer has dominion over him. 10 For the death he died he died to sin, once for all, but the life he lives he lives to God. 11 So you also must consider yourselves dead to sin and alive to God in Christ Jesus. It’s amazing that the unsaved understand this in their own way. It’s just a fact that the unsaved understand the gospel intuitively better than the vast majority of Protestants. Most unsaved people know that salvation involves the loss of who they presently are in exchange for a new life that is in the wind so to speak. This is what Christ was telling Nicodemus as recorded in John 3 and why Nicodemus came to Him under cover of darkness—Christ was a threat to the present life he knew. The fact that Christ told him that he must be born again which would result in a new, and completely unpredictable life correlates with the fact that Nicodemus came to Him under cover of darkness. Nicodemus was afraid of losing his present life, and therefore, Christ addressed the issue forthwith. “Just believe” and “faith alone” minus the new birth is a Protestant hallmark. It boils down to a mere glorified assent to the facts of the gospel. It is not the losing of present life in order to find the new one. It is not repentance, i.e., a turning from the old life and following Christ in literal death and resurrection. Water baptism is a public confession that you understand this. Now many will protest that we are doing something to be saved other than believe; we are “following” Christ. But it is a decision, not some work of following. The Spirit does the baptizing, not us. We are saved by wanting that for our life and accepting the gift that is offered. But likewise with any gift, once it is given, the receiver owns it. It is now up to us to work out our own salvation with fear and trembling (Phil 2:12,13). Here, “salvation” refers to redemption (the saving of the body, Rom 7:24, 8:23), not the saving of the soul, and work/fear refers to the new Christian person and life, not our onetime new birth. The Christian life is a process; the new birth is a onetime event. Before we were saved, our fear regarded condemnation. Now our fear regards chastisement and sin that leads to unnecessary deaths (consequences for sin). There is no work FOR salvation, but there is a work IN the Christian life, specifically, a work of love (Gal 5:6). On the flipside, even though there is not a work FOR salvation (justification), there is a work IN being unsaved that has a specific wage paid by a specific master. We met him in the previous session, the sin master. This is how the Bible frames this: there are two masters who pay two different wages: one pays wages for death, and the other pays wages for life. ALL people in the world are earning one or the other in varying degrees. Either group can do bad or good works (Rom 6:20), but one can only be credited for death, and the other can only be credited for life. These are two different wages paid by two different masters. These two groups, lost and saved, are under two different laws that determine their wages. The lost who belong to the sin master are “under law” and its condemnation, the law of sin and death. Those under this law can only bear fruits of death. In contrast, those purchased by Christ (“you have been bought with a price” 1Cor 6:20, 7:23) can only bear fruits for life. They are identified as “under grace,” or under the law of the Spirit of life (Rom 6:14, 8:20). Romans 6:15 – What then? Are we to sin because we are not under law but under grace? By no means! 16 Do you not know that if you present yourselves to anyone as obedient slaves, you are slaves of the one whom you obey, either of sin, which leads to death, or of obedience, which leads to righteousness? 17 But thanks be to God, that you who were once slaves of sin have become obedient from the heart to the standard of teaching to which you were committed, 18 and, having been set free from sin, have become slaves of righteousness. 19 I am speaking in human terms, because of your natural limitations. For just as you once presented your members as slaves to impurity and to lawlessness leading to more lawlessness, so now present your members as slaves to righteousness leading to sanctification. This is why Christ came to end the law (Rom 10:4). The law that He ended is the law of sin and death. EVERYONE born into the world is under the law of sin and death and condemnation. This is how we know Christ died for everyone ever born into the world. He also purchased mankind from the sin master; eternal life is the promise, new birth is the gift (if received by faith) resulting in freedom from condemnation and the fruits of death. The believer now “upholds” the law he/she is free to serve: the law of the Spirit of life also known as the “law of Christ” and the “law of liberty.” Salvation is a free gift, but the Christian life is a work that can earn rewards. Hebrews 6:10 – For God is not unjust so as to overlook your work and the love that you have shown for his name in serving the saints, as you still do. 1John 4:18 -There is no fear in love, but perfect [mature] love casts out fear. For fear has to do with punishment, and whoever fears has not been perfected in love. [Because they fear condemnation]. Watch all of Paul’s 3rd session below.